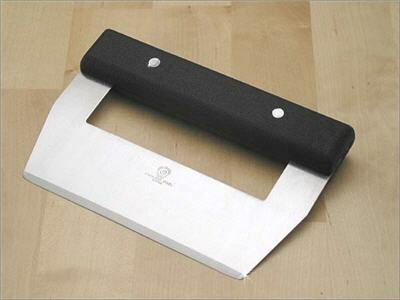 So this will be a quickie post about a new category of things – Kitchen Tools. You know, those things that help us make the food we love easier, faster, better and so on. Personally, I have to confess that I have a condition. My name is Gary and I love kitchen tool gadgets. I can’t walk past a store that focuses on them. These stores taunt me like a dealer of addictive proportions. Now one good note is that Alton Brown has taught me that unitaskers are BAD BAD BAD. So I do my best to keep this in mind while wandering past racks and rows and walls of everything imaginable to fill up the drawers of my kitchen. This past weekend I visited family in Ohio and stopped at a well-known place for food around the world. This place (which we’ll post about some other time – it’s a personal fave of the 3 Bears here) has such a section of kitchen gadgets, tools, cookware and more in the back. And it was here that I picked up a Scraper / Chopper. Now I’m already familiar with these from having used them in the past when I worked at restaurants in preparing dough portioning mostly. 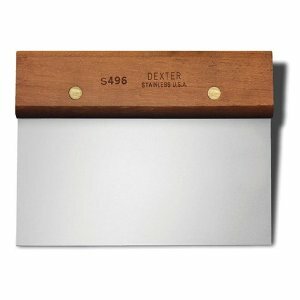 What is a Scraper / Chopper? Well as you can see, it’s pretty basic in design. One decent flat metal piece with a handle attached. The first one is the type I was used to using in the past. However these things have evolved over the years and now they’re made of different materials, come in different sizes and some have ruler measurements on them. So the one I picked up is this basic model with a wooden handle (notably I gave into my OCD and got one with the ruler markings on it). I lucked out and picked up for a mere $4.95. These Scraper / Choppers usually run about $10 up to $20 each. So I think I got a deal and can’t wait to put it to use. Now I’m not sure what the going rate is locally all across the country, but I would suggest checking out not only kitchen gadget type stores, but don’t forget about restaurant supply businesses as well. They tend to carry the good to awesome quality stuff that can withstand lots of use and abuse. Oh and if you’re wondering what on earth you do with such a thing, here’s some info to help. 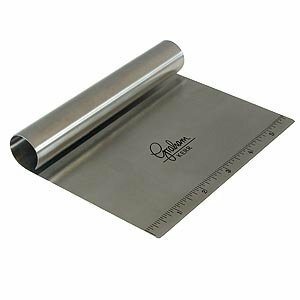 This handy tool is primarily meant to be used to section dough into portions for anything from pie crusts to pastries, and scrape dough from a floured surface. However it has proven incredibly handle for also lifting cookies from a cookie sheet, or for chopping firm vegetables like celery. 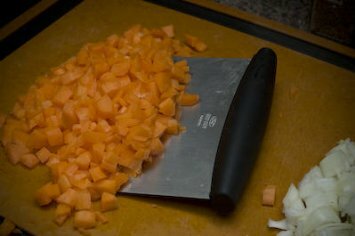 Now the truest and best feature is that you can use it as a transport tool to take a pile of something from one place to another… like just chopped vegetables to pot/pan/bowl. 🙂 Nifty huh? Now yes you can use your hands, but trust me. 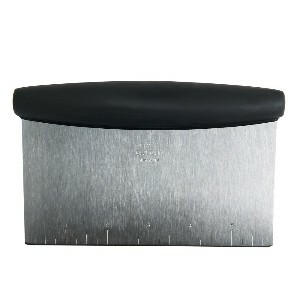 This handy dandy tool is worth its weight in gol… hmmm. Maybe not gold given the market pricing of late. 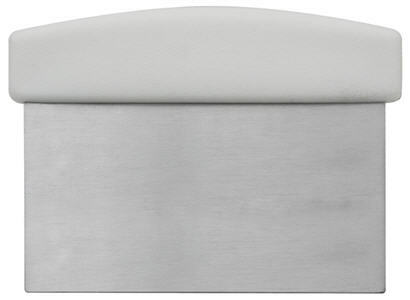 But anyways, it is a great investment for any kitchen! This entry was posted in Gary's Stuff, Kitchen Tools, Main. Bookmark the permalink. This is my favorite kitchen gadget too!